Kars4Kids: 15,000 Philadelphia children are at risk of dropping out. One out of every four children, do so. Why? Darryl Bundrige: Research from Johns Hopkins University shows that students who are at risk of dropping out can be identified as early as elementary school using three early warning indicators: low attendance, disruptive behavior, and difficulties with course work in math and English. Children who don’t receive the necessary interventions in those areas in time have up to a 75% chance of dropping out. Kars4Kids: How is City Year Philadelphia addressing the drop out issue? Darryl Bundrige: Research also shows that students who reach 10th grade on track and on time are four times more likely to graduate. This is City Year’s mission. We partner with schools to place our corps members in the schools that need us the most and provide students with one-­on-­one tutoring support in academic subjects and mentoring or coaching in attendance and social-­emotional learning to overcome challenges they face both in and out of school. Kars4Kids: Part of your program involves monitoring school attendance. If a kid doesn’t make it to school, you call the parents. Are there some cases where calling the parents proves ineffective? What do you do in such a case? Darryl Bundrige: Attendance monitoring and engagement are key parts of our work. Particularly with students who are capable with getting themselves to school, support involves talking with students about their time management and organization skills as well as challenges. Other tactics include everything from engaging with students, school staff, parents and guardians, to more out-of-‐the-ordinary gestures such as providing a high-­energy, cheerful welcome as students arrive to school each day. Our integrated approach helps us to make inroads with our students across different cases and circumstances. Kars4Kids: One of the things you do is greet children when they come into school. Is this something we should be doing more of in our schools? Why is this important? Darryl Bundrige: Every morning in 19 schools across Philadelphia, students arrive to school and pass through a tunnel of chanting and cheering AmeriCorps members dressed in City Year’s iconic red jackets. Power greetings are a signature activity for City Year and a powerful way to start the day. As we all know, how you begin your day can greatly determine how the remainder of it will turn out. Because of this, we feel it’s important to kick off the day in a positive manner. In addition, this is a great opportunity to see the students as they are coming into school and—judging by what they say, their facial expressions, body language, and level of interaction with others —what kind of morning or previous evening might they have had and what mindset they are bringing to school. Kars4Kids: Parent engagement is an important part of your program. Are parents who work, for example, a night shift, able to maintain some sort of engagement with a child’s schooling? Darryl Bundrige: While we cannot speak to what parents or guardians can or cannot do, our interactions with them tell us they want their children to be successful and they want to give them the tools and resources to do so. They appreciate our efforts to support students and are pleased when we call them to say how well their student is doing or how much effort they are putting in as opposed to calls home that only share student mistakes. Kars4Kids: Tell us about your partnership with AmeriCorps. Darryl Bundrige: Over 20 years ago, Congress created AmeriCorps, an innovative national service program designed to harness the energy and ingenuity of American citizens to address the nation’s most pressing challenges. Education is the single largest priority area for AmeriCorps and so grantees of the program, such as City Year, are providing education services in one in ten public schools, serving students from one out of four persistently low achieving schools. The support the federal agency provides has allowed City Year to expand from one city (Boston) to 29 cities nationwide. More than 20,000 AmeriCorps members have served with City Year, delivering a combined 29 million hours of service. We are proud to be an AmeriCorps program. Kars4Kids: Do any of the students continue the connection to an AmeriCorps volunteer after a volunteer’s 11 months are up? Darryl Bundrige: There are a couple of common ways that such connections remain. 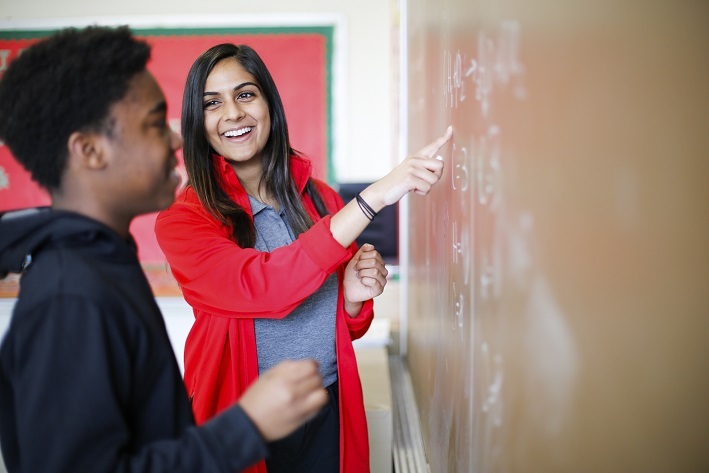 For many City Year members, their year of service leads to a career in education. 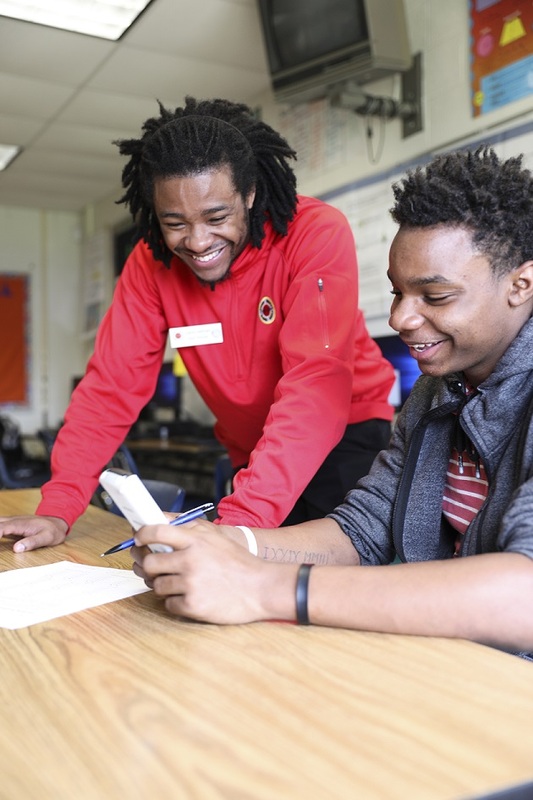 City year members often graduate and take jobs in the schools they served in or in the community and continue to work with students in those capacities. There are also parents who ask our members to continue tutoring or mentoring their students after our members have graduated from City Year. Kars4Kids: What is a “near peer” relationship? Darryl Bundrige: City Year brings together diverse, talented teams of young adults. Specifically, our AmeriCorps members are between the ages of 18 and 25. As an organization that serves in elementary, middle, and high schools, this means that our corps members were very recently in school just like the students they serve. This near-­peer model paves the way for relationship building, establishing trust, and many other factors that are critical for our work to succeed. Kars4Kids: Can you tell us a bit about how you partner with teachers and principals to provide classroom support? Darryl Bundrige: Our work inside the schools we serve would not be possible without the partnerships we have with principals, teachers, and school staff. It is very much a collaboration as we diligently work to enhance and improve student outcomes. We work closely with teachers to identify learning gaps and help differentiate instruction for students who need it most through one-­on-­one tutoring. Teachers will share the lesson plans with AmeriCorps members to further help with instruction differentiation and members will share their tutoring plans as well. Corps members then provide teacher-­directed support in delivering coursework and instruction. Our AmeriCorps members will join in professional development sessions that principals provide for their school staff. Kars4Kids: What’s next for City Year Philadelphia? Darryl Bundrige: Our strategic priorities for the next several years include investments in our people (AmeriCorps members and staff); expanding our sustainability and financial capacity; continuing to improve our student outcomes; and increasing awareness about City Year Philadelphia and the work that we do. What we are going to do as part of the innovative investments into student outcomes and the way they learn is going to be critical. We seek to look at how we utilize the power of our 18-to 25-year-olds to leverage that with technology, math skills, and more to continue to maximize outcomes.